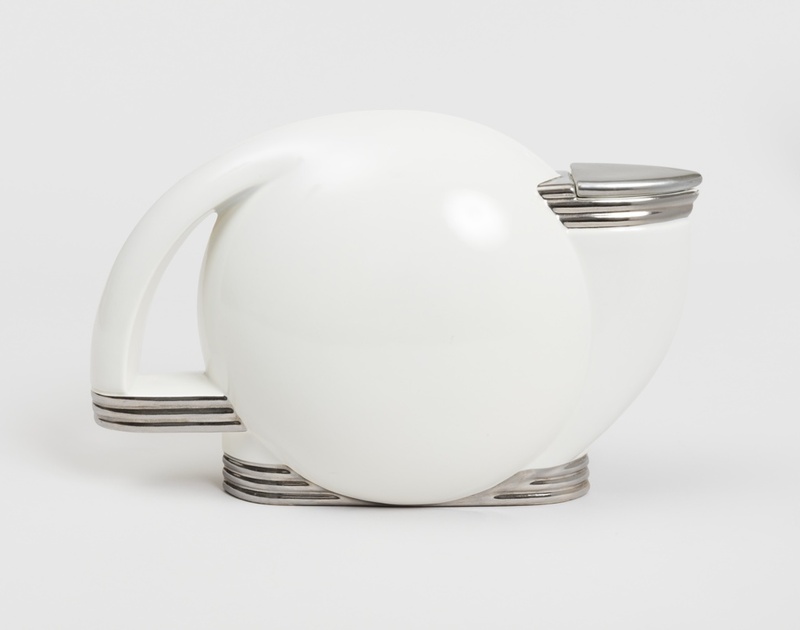 In a December 2016 visit to Cooper Hewitt, George R.Kravis II converted the Promised Gift of this teapot to a gift, joining a large group of objects that helps tell the story of twentieth and twenty-first century design, much of which represents the best of design often for everyday use. It is the first piece by Paul Schreckengost to enter the museum’s collection and is the most prestigious of all of his designs. It complements and contextualizes the ceramic tableware designs of his younger brother Don Schreckengost and the art pottery of his well-known older brother Viktor Schreckengost, which are also in the museum’s collection. In addition, this 1938 teapot is a stunning example of American streamlined design from the interwar period. Its circular form and bands of platinum reeding evoke the aerodynamic designs of the period’s great automobiles and trains, like Chrysler’s 1934 Airflow and Henry Dreyfuss’ 1938 redesign of the 20th Century Limited. For all three Schreckengost brothers, the 1930s marked the beginning of each of their long careers in the commercial ceramics industry. Born and raised in Sebring, Ohio—a town founded for pottery production by the entrepreneurial Sebring family in 1900—Paul and his brothers grew up amidst the commercial ceramics industry. Their father, Warren Schreckengost, worked for the French China Company in Sebring and older brother Viktor recalled fetching water for work in the kiln as a young child. Paul began his career in the late 1920s as a mold-maker for the Gem Clay Forming Company in Sebring after briefly attending The Cleveland Institute of Art. He eventually became the chief designer for the company and remained in that role until 1976. He was best known for his superb technical skill and ability to create figurative forms. This teapot was created in 1938 as a limited edition holiday gift for some of the company’s best clients. It was never put into commercial production and the following year Paul designed a matching punch set. Compared to his brothers’ careers in the commercial ceramics industry—particularly Viktor’s —Paul’s designs have received little scholarly attention and beckon further research. Henry Adams and Viktor Schreckengost, Viktor Schreckengost and 20th-Century Design (Cleveland: Cleveland Museum of Art, 2000) 7. John Stuart Gordon ed., A Modern World: American Design from the Yale University Art Gallery, 1920-1950 (New Haven, Conn: Yale University Press, 2011) 330.